Millionaires Club II Video Slot Guide & Review - Casino Answers! Millionaires Club II is a 5-reel, 9-line video slot developed by Cryptologic, featuring a wild substitute symbol, scatter wins, a bonus game and a progressive jackpot. You can play the Millionaires Club II progressive jackpot slot at [Americans: Unfortunately due to legal restrictions you are unable to play at any of the online casinos this game is at. We recommend you trying playing the unique slots at Win A Day Casino instead.]. Millionaires Club II looks at life at its finest. The best things that money can by are all seen on the Millionaires Club II progressive jackpot slot. Symbols are the Millionaires Club symbol, Platinum Credit Card, Jet, Mansion, Yacht, Sports Car, Diamond, Ring, Rolex Watch, Golf Clubs, Champagne and Necklace. Piano music plays at all times during the Millionaires Club II video slot and “Ching” sounds play with every spin you make. Millionaires Club II is a sequel to the original Millionaires Club progressive jackpot slot. For a look at the Millionaires Club II progressive jackpot slot from Cryptologic, a screenshot is below. Unlike many progressive jackpot slots, you can set your bet on the Millionaires Club II video slot. Available bets are $0.10, $0.15, $0.20, $0.25, $0.50, $0.75, $1, $2, $3, $4, $5, $6, $7, $8, $9, $10, $11, $12, $13, $14, $15, $16, $17, $18, $19 and $20 per line. You can select from 1-9 paylines. You can bet as little as a dime on the Millionaires Club II progressive jackpot slot and all the way up to $180 per spin. To play all 9 paylines on the Millionaires Club II slot machine, hit the “Bet Max” button. For other bets on the Millionaires Club II slot game, press the “Spin” button. The highest paying symbol on the Millionaires Club II video slot is the Platinum Card symbol. If you hit 5 of these symbols on an active payline, you will win the 10,000 coin top fixed jackpot. The Platinum Card symbol is wild and will substitute for all symbols except for the Millionaires Club scatter symbol. The Jet symbol is the second highest paying symbol at up to 5000 coins and the Mansion symbol can pay up to 1000 coins. The main feature of the Millionaires Club II video slot is its progressive jackpot. At the time of this writing, it is at $700,200. Whenever it is won, the Millionaires Club progressive jackpot will reset to $175,000. To win it, you must hit 3 Millionaires Club scatter symbols anywhere on the reels and trigger the Millionaires Club II wheel bonus game. In the bonus game, you can spin the wheel to win a prize. You can keep spinning the wheel to win more prizes and potentially win the progressive jackpot. If the wheel lands on a “B” symbol, you will lose all of your cash prizes and the bonus game will end. You will receive a consolation prize instead. Play this bonus game and try to win the Millionaires Club II progressive jackpot at [Americans: Unfortunately due to legal restrictions you are unable to play at any of the online casinos this game is at. We recommend you trying playing the unique slots at Win A Day Casino instead.]! Payouts are displayed on the Paytable. Payline wins are multiplied by the bet per line. Highest win amount is paid on each selected payline. Scatter wins are multiplied by total bet and added to payline wins. Feature wins are added to scatter and payline wins. Winning combinations pay from left to right only, except for the Scattered Millionaires Club Logo symbol. By today’s standards, the Millionaires Club II video slot is a little dated, so if you are looking for the most modern video slot, you might want to go with the Millionaires Club III progressive jackpot slot. If you just want a 9-line progressive jackpot video slot, Millionaires Club II will fit the bill for what you are looking for. You can become a millionaire if you win the Millionaires Club II progressive jackpot at [Americans: Unfortunately due to legal restrictions you are unable to play at any of the online casinos this game is at. We recommend you trying playing the unique slots at Win A Day Casino instead.]! Can players from the United States play the Millionaires Club II video slot? 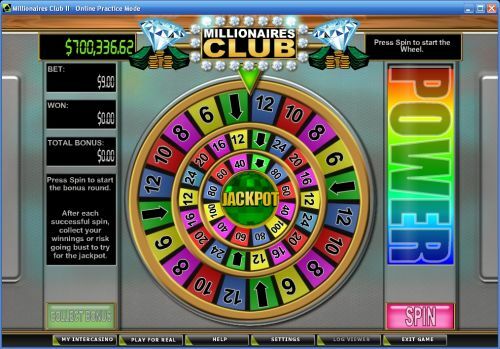 Unfortunately, American players cannot play the Millionaires Club II online slot for real money. For a great selection of progressive jackpot slots players from the USA can play, please visit Bovada Casino. How do I win the Millionaires Club progressive jackpot? To win the Millionaires Club progressive jackpot, you must first trigger the bonus game by hitting 3 Logo scatter symbols. From there, you will be taken to a wheel bonus game where you will most likely have to make three successful spins. On the final spin, the wheel must fall on an arrow, which will take you to the progressive jackpot. You can do it in fewer than three spins if you hit an arrow on the outer and middle wheels. Is there a Millionaires Club 2 Flash game that I can play for free? 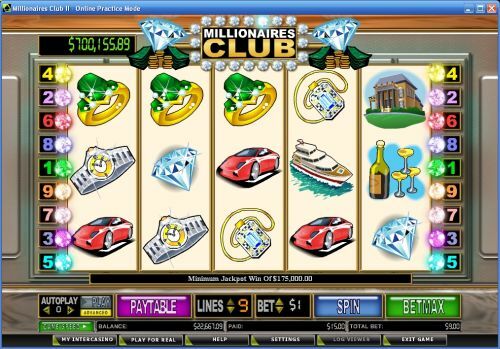 There is a Millionaires Club Flash game that you can play at [Americans: Unfortunately due to legal restrictions you are unable to play at any of the online casinos this game is at. We recommend you trying playing the unique slots at Win A Day Casino instead.]. Unfortunately, you can only play it for real money. If you experience any difficulties with the Flash software, try installing the latest version of Adobe Flash Player. Can I play the Millionaires Club 2 video slot for free? Yes, you can play Millionaires Club 2 in practice mode. Many casino software providers will not allow players to play for free, but Cryptologic does allow its players to play their progressive jackpot slots for free to try them out.